This collection of 7 books targets state academic standards inclusive of print awareness and analyzing text. Students will build and use complex and varied vocabulary through reading passages, discussions and interactive activities. Hardcover. 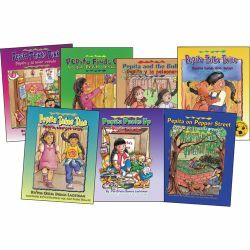 Titles include: Pepita and the Bully / Pepita y la peleonera, Pepita Finds Out/Lo que Pepita descubre, Pepita on Pepper Street/Pepita en la calle Pepper, Pepita Packs Up/Pepita empaca, Pepita Talks Twice/Pepita habla dos veces, Pepita Takes Time/Pepita, siempre tarde, and Pepita Thinks Pink/Pepita y el color rosado.